A David Johnson, of many. An analysis of Silicon Valley’s 2015 economy released this week by the think tank Joint Venture found that on average, women in the San Mateo and Santa Clara counties earned far less than men even when comparing similar educational attainment. This wasn’t a surprising result, but the extent was: men in Silicon valley are paid 61 percent, or $34,000 more per year, than women when both have bachelor’s degrees, versus San Francisco proper (men are paid 20% more), California (41% more), and the U.S. as a whole (48% more), by the index authors’ measure. Nationwide, the debate about how much women make compared to men is well-covered ground. It’s some number between 77 percent and exactly the same, depending on where you fall on the ideological spectrum. But what may be surprising is that as of 2013, of 140 occupations and occupational categories in the U.S. that could be compared across gender lines, only three paid women more than men, representing 0.5 percent of the female workforce. There are some natural caveats to this. 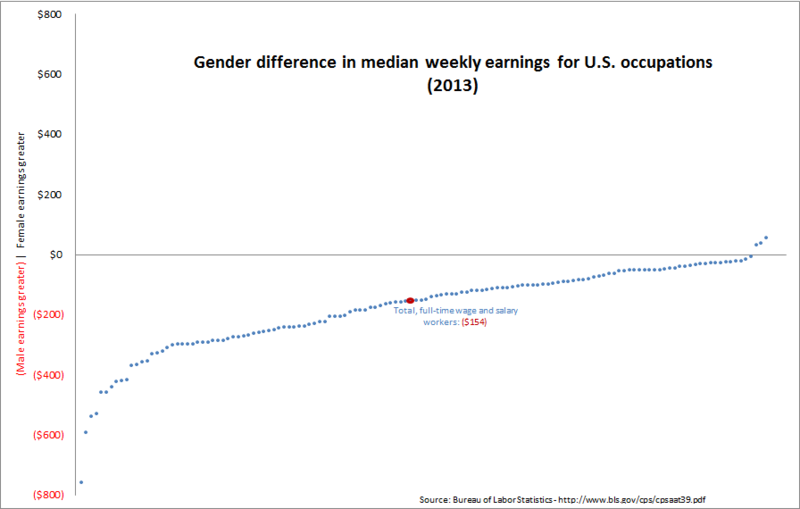 The majority of occupations the Bureau of Labor Statistics tracks don’t have enough male and female workers to compare a median weekly wage directly. 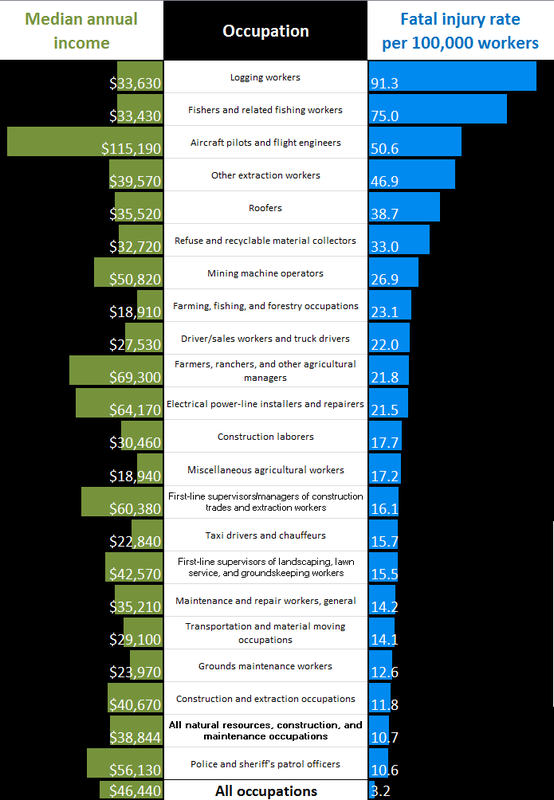 Not all of these jobs weigh equally because some employ more than others. And finally, it’s not an apples to apples comparison because… well, there’s a lot in that ellipses. To address the first one, it’s true there are more than 560 categories and sub-categories for industries and occupations tracked by the BLS; only a quarter can be directly compared across gender. * But at the top level, the evidence is overwhelming: In total and in every industry, women are paid less than men. In her 2014 article arguing against a real wage difference, Christina Hoff Sommers wrote in the Daily Beast that women’s lifestyle choices are to blame. Women are responsible for going into professions that pay less, such as counseling and social work, she says. 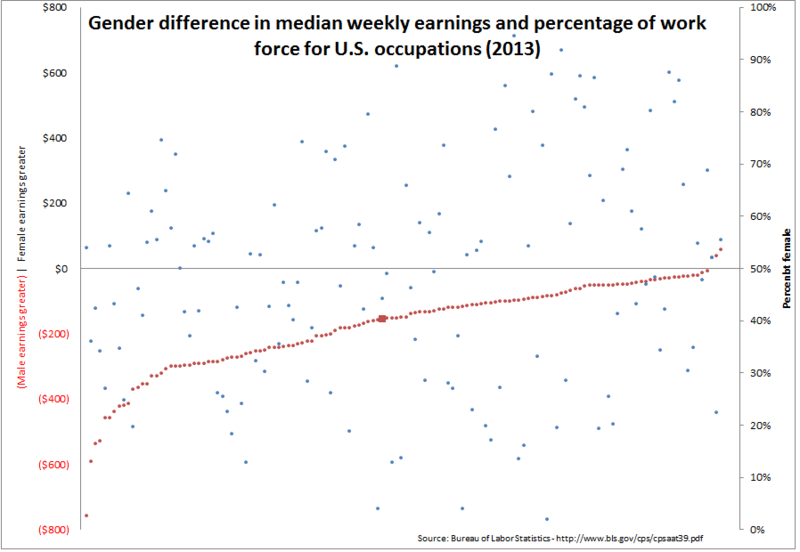 That’s true; women do represent more of the labor force in some underpaying professions than men do. On average, they still are paid less than their male counterparts for the same underpaying profession. That includes female teachers for elementary ($88 less per week, 80% of staff) and secondary school ($107 less, 55% of staff). 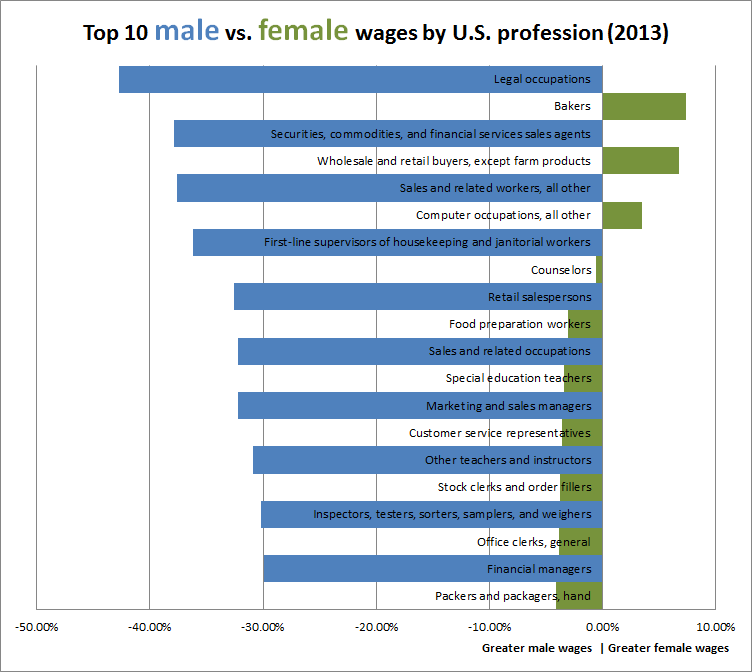 Indeed, the gender ratio in a profession doesn’t have any clear effect on its wage parity. Ultimately, this defense, and it’s not hers alone, comes down to trying to avoid saying outright that women don’t really deserve to be paid equally. Thus the idea that women aren’t equivalent to men in the workplace because they aren’t willing to work as dangerous of jobs, even though dangerous jobs don’t usually pay better that average; or they want to work less hours, even though child care responsibilities fall more heavily on women, keeping many out of the labor force full-time. Women aren’t confident enough, or too headstrong, or they’re too warm, or too bossy, or promote too many women, different explanations go. Yet there is a pay gap at every level, whether looking at how women are paid by occupation as the embedded graph above does, how they’re paid by marital and child status, or even by educational achievement. 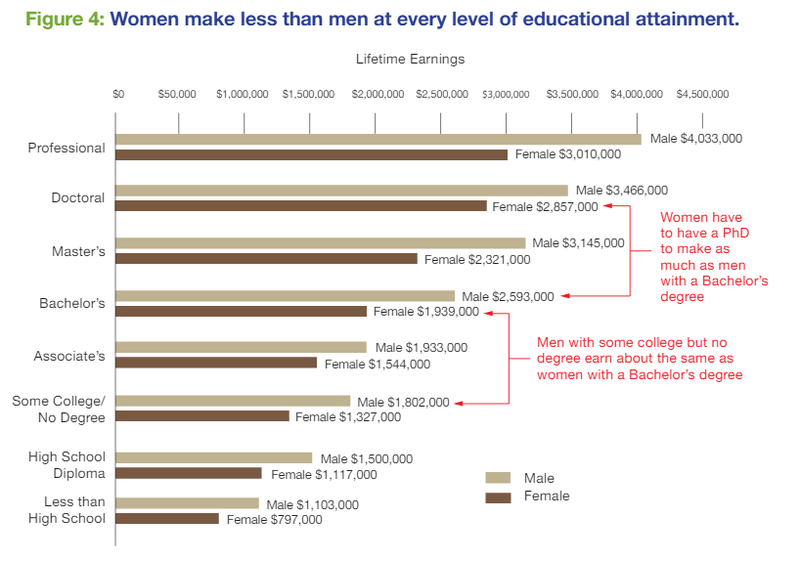 If you didn’t click that last link, it’s important: a woman needs a post-baccalaureate degree to earn as much in weekly wages as a man with some college education. A Georgetown University study found a similar thing for lifetime income. Maybe women just need to ask for raises more often. Maybe society just needs to push more women into STEM courses. Maybe we just need a maternity leave equivalent to Kenya instead of firing women for coming back to work after giving birth and having to use a breast pump. Or maybe we just need to pay women equal to men. In total, this represents all 230,000 of the more than 46 million women employed receiving favorably disproportionate pay, or less than 0.5 percent. On their own, legal occupations employ 707,000 women, 54 percent of everyone in that professional category. But for every dollar in wages received by a man employed in legal occupations, a woman gets 57 cents, or, on average, $754 less for each woman for each week. * If we cheat it and subtract male or female median earnings from total median earnings when we have only one to go by, we can add Therapists; Dental hygienists; Nonfarm animal caretakers; Information and record clerks, all other; and Physician assistants to the three mentioned already as higher than their male counterparts, for a total of 1.5 percent of female workers. The reason I’m not counting them is that it I trust the BLS’s reasons for excluding the data and not performing the same trick, and because the five female jobs adds another 40 overperforming male jobs as well. Interestingly, the four absolute parity professions were: Dental assistants; Childcare workers; Tellers; Sewing machine operators.